RJ Corp an Indian multinational with businesses ranging from beverages, fast food restaurants, ice cream, dairy products, education, beer breweries, lifestyle products and healthcare services. Under the leadership of Mr. Ravi Jaipuria the group has made significant progress by laying a strong foundation for ambitious growth through new ventures, alliances and acquisitions. With emphasis of acquiring and retaining the best talent, RJ Corp has created a high performance culture with focus on leadership, innovation, entrepreneurship and integrity. 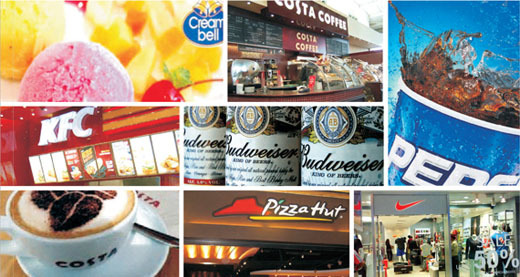 RJ Corp has the trust of worlds top brands such as Pepsi, Pizza Hut, KFC, Cryoviva, Costa Coffee, Nike etc . RJ Corp today has 15 carbonated and non-carbonated bottling plants of Pepsi In India, two Modern state of Art packaging plants and has diversified to encompass new ventures in the varied fields of retail, food, education and healthcare with operations in India, Nepal, Sri Lanka, Mauritius, Uganda, Singapore and Thailand. The group has ventured into restaurant business through 100% owned Devyani International Limited (DIL), which is engaged in running Pizza Hut, KFC and Costa Coffee outlets in different parts of the India and Africa. Cream Bell had its inception in 2003, a Joint venture with a “French Dairy Major” – Candia. Cream bell has pioneered many variants in ice cream with over 50 rich blend of exotic international and traditional Ice-cream's.